HDN: Houston Dale Nutt, head coach of the Arkansas Razorbacks who moonlights on the Baptist revival circuit, criss-crossing the state in a Cessna twin-engine to preach the good news of self esteem, usually after a catfish dinner and a highlight film. He has all the qualities that we both love and hate about revival speakers. Love: he gets us fired up and leads a rousing version of our favorite worship fight song. Hate: he often preaches half-truths to get us fired up and singing. JFB: J. Frank Broyles, Ath-a-letic Directuh of The Univuhsity, a silver-haired southern power broker with an August National Club membership to prove it, who sometimes does the meanest things in the most gentlemanly manner. He is considered a quasi-deity in Arkansas, but more like a capricious Greek god than the Benevolent Father of biblical fame. His name is sometimes used in statements like "JFB bless America," "thank JFB," and "JFB have mercy." Big Jim: Jim Lindsey, captain of the 1964 National Champion Razorbacks coached by JFB, a team which also included such notable football personalities as Jerry Jones and Jimmy Johnson. Big Jim is now a deep-fried real estate tycoon whose signature developments are B-grade apartment complexes built around par three golf courses. He's also vice-chairman of the BOT (see next) and behind-the-scenes weight-thrower-arounder, rumored to have taken a bullet for JFB during an attempted coup in 2002. BOT: Board of Trustees of the entire University of Arkansas System. Big Jim is their most influential member. They have ultimate decision-making authority over JFB. Or do they? John White: Chancellor of the University of Arkansas at Fayetteville, a former engineer who ascended to the UA helm after an illustrious academic career at Georgia Tech. On paper the "boss" of JFB, he has the political shrewdness of Howard Dean and thus, no real authority. Big Jim clipped his wings when he tried to overthrow JFB and replace him with his right-hand woman in 2002. Gus: Gus Malzahn, currently the offensive coordinator for the Tulsa Golden Hurricane, most recently the offensive coordinator for the Razorbacks and before that a shooting-star high school football coach at Springdale High, 10 minutes from the University of Arkansas campus. He is a guru of a wide-open spread offense with a self-authored paperback book and VHS library to prove it. The closest thing you can find to a football intellectual. 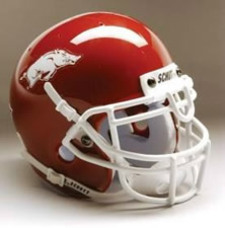 Mitch: Mitch Mustain, freshman QB for the Razorbacks and 2006 GatoradeParadeUSATodaySportsIllustratedRivalsESPN.com National High School Football Player of the Year for Springdale High, where Gus was his coach prior to joining the Razorbacks where Gus was his coach. Beck: Beck Campbell, Mitch's mom, a tough-talking, "getrdone" southern woman who drives a bright red Ford F-150 extended cab pickup truck with running boards, chrome toolbox, Razorback trailer hitch, and satellite radio permanently tuned to sports talk shows...wait, that's my mom...nevertheless, Beck is a smart,tough woman who wants everything to turn out great for Mitch. Murray State Mafia: HDN's inner circle of assistant coaches who have been with him since 1996 when he was the head coach of the Murray State Racers, which is rumored to be in Kentucky. The Mafia includes Bobby "The Defender" Allen (linebackers coach), Consigliere Danny Nutt (running backs coach; HDNs little brother) and Mike "The Mule" Markuson (offensive line coach and "running game coordinator"). Springdale Mafia: A nebulous, shadowy group of people from Springdale who support hometown heroes Gus, Mitch, and Beck while opposing the Murray State Mafia. The Mafia is funded and backed by one Big Bird: Tyson Poultry Magnate Don Tyson, creator of the Chicken McNugget. Wally: Wally Hall, sports editor of the Arkansas-Democrat Gazette, beloved from Bentonville to Bald Knob as writer who makes William Faulkner look like a bumbling George W. Actually, that was a joke and a clever use of rhetorical analogy...imagine how crazy you'd go if I did that every paragraph. Saying Wally is a writer is like saying I'm an Abercrombie & Fitch model. We're both balding short men who don't look good in v-neck sweaters, even though we still try to wear them. Now what happens when you get HDN, the Murray State Mafia, and the Sunshine Pumpers on the wrong side of Gus, Mitch, Beck, the Springdale Mafia, and the Darksider? What happens when Frank and Big Jim descend from the heavens in Zeus-like fashion to manipulate the man-drama? What happens when Wally tries to explain it all? You get a Friday Already-Not Yet. Just for the record, I am nothing like Beck Campbell. I never once had a meeting with the Dean of the Walton School of Business while Hunter was a student at the University of Arkansas, and frankly, I would have been horrified if Hunter had demanded a release from his academic scholarship and asked to transfer.